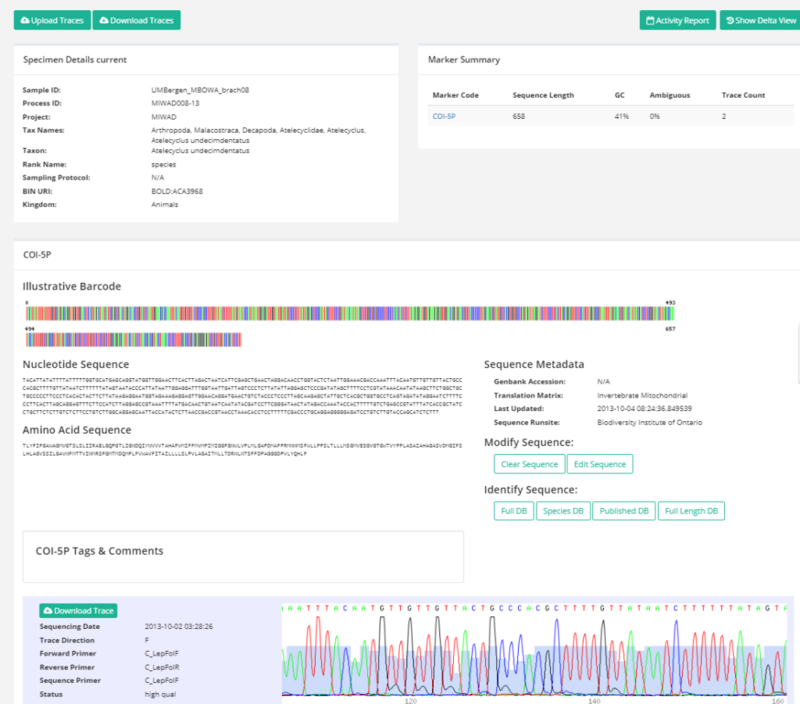 In a previous blog post I explained briefly how DNA-sequences are produced for the DNA-barcode library. 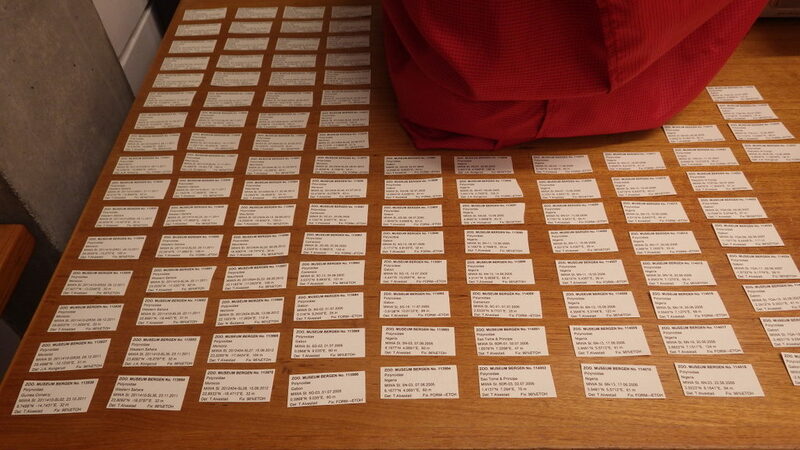 Now I will show how the BOLD database can be utilized to identify species from sequences. Some of the equipment used to produce DNA-sequences in our lab. 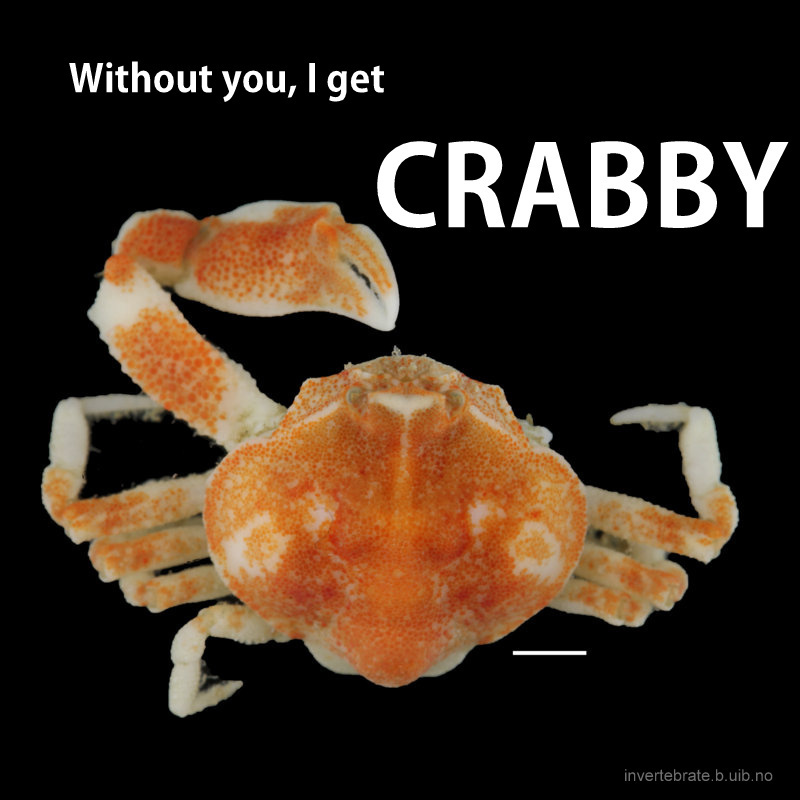 Say you have access to a lab that can produce DNA-sequences and you have a sample of a crab you cannot identify because some of the key characters are on body parts that have been broken and lost. 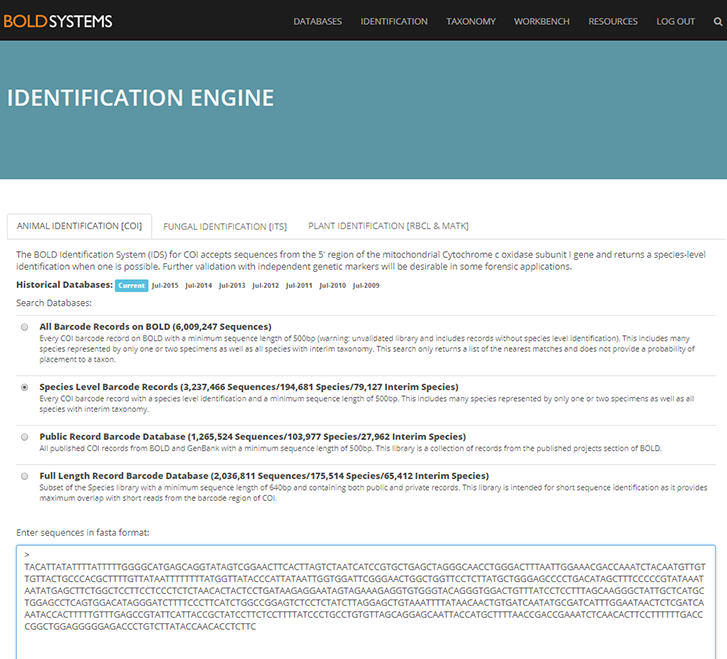 You produce a DNA-sequence from the “barcode-gene” and open the identification engine in BOLDSYSTEMS.org. Having submitted your query to BOLD, you wait for some seconds for results. In this example BOLD returned the following window. 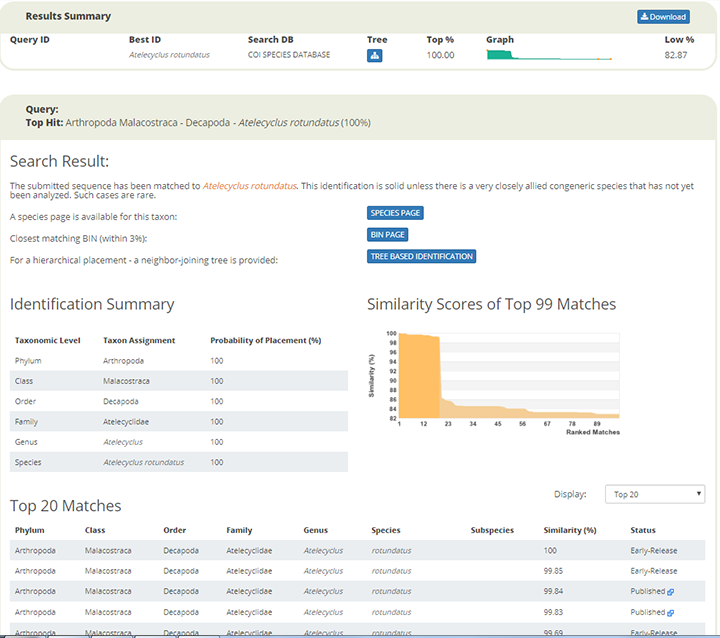 The results window lists the top matches in terms of sequence similarity, and in this case we have 100 % similarity match with the crab Atelecyclus rotundatus. There is also an option to display the results as a TREE BASED IDENTIFICATION. When clicking on the option tab, the closest hits are clustered in a so-called Neighbour Joining Tree. In the window below you see parts of the tree where our unknown DNA-sequence has been joined to a group of other sequences in BOLD that have been deposited as Atelecyclus rotundatus barcodes by other biodiversity labs. 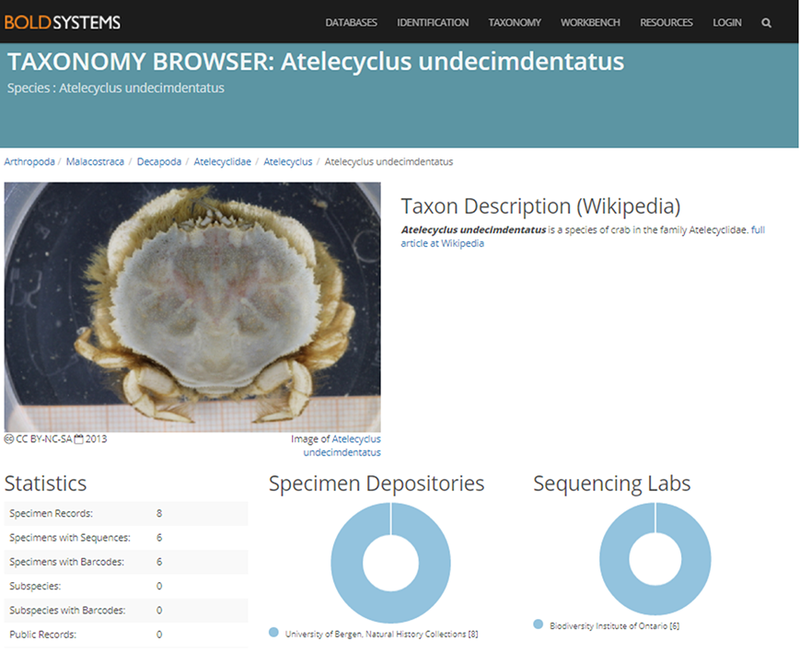 The species page for Atelecyclus rotundatus gives us more information about this crab and about its records in BOLD. 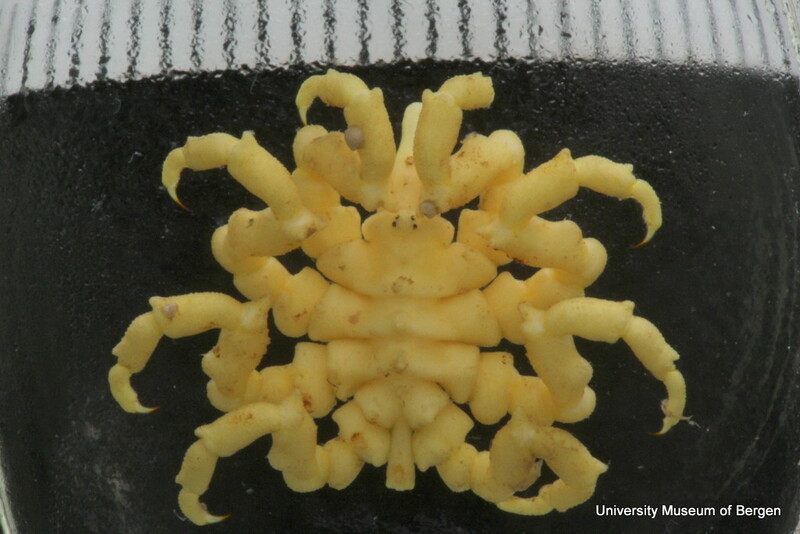 If in fact your sequence was produced from an unknown crab, this identification seems convincing. But sometimes you should think twice about search results, and this will be the topic of a future blog post. 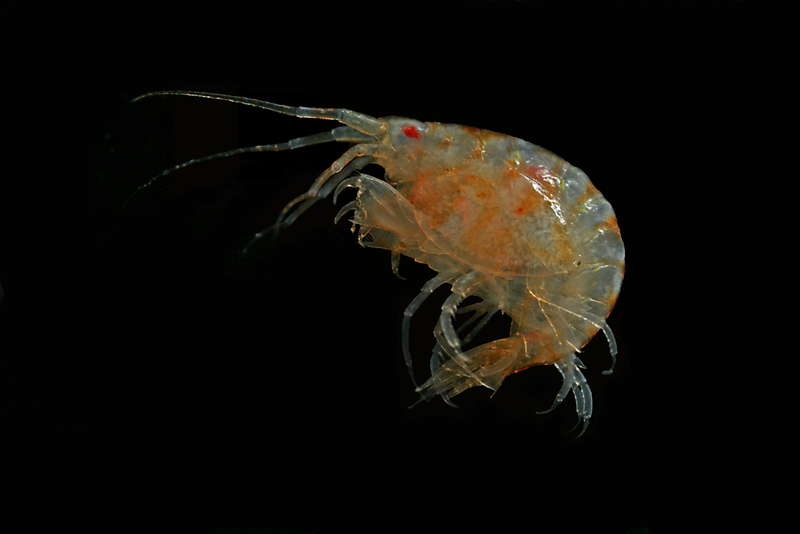 This entry was posted in 2018 december calendar, Crustacea, MAREANO, NorBOL, Uncategorized on December 8, 2018 by EW. 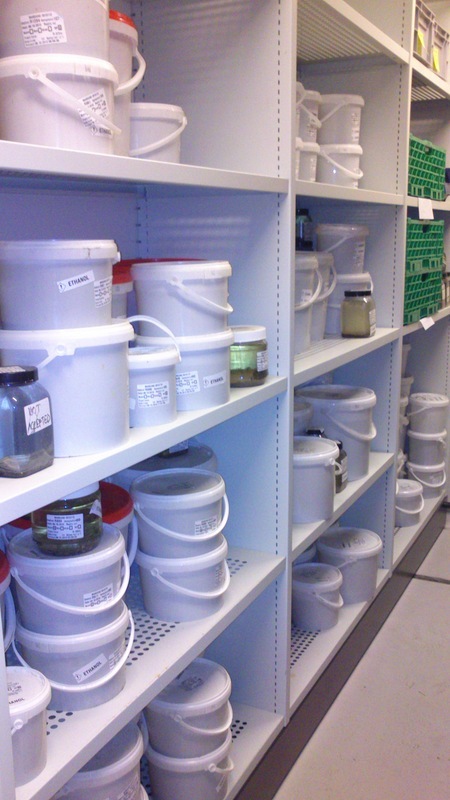 Much of the activities in our invertebrate collections are dedicated to so-called DNA-barcoding. 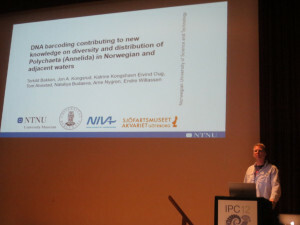 Our mission in the NORBOL consortium is to produce DNA-barcodes, particularly for marine fauna in Norwegian waters and to make these barcodes available with open access to records and metadata in Boldsystems.com. 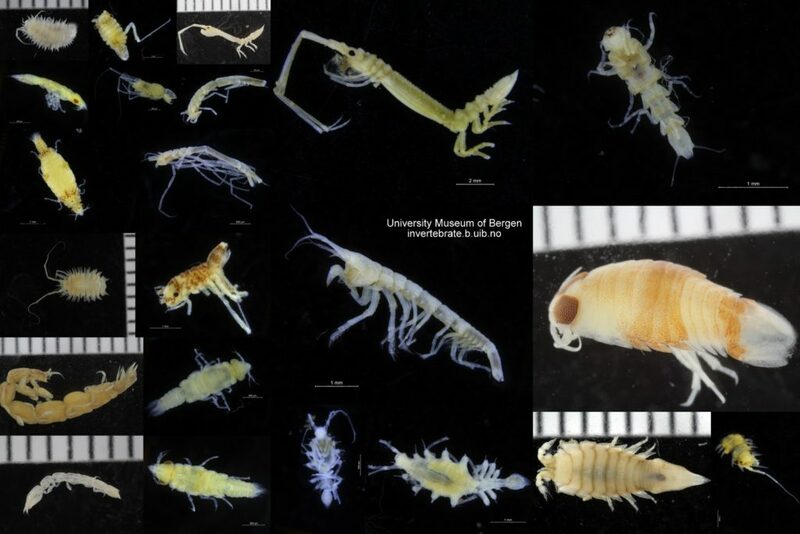 In the same manner we have also worked to produce DNA-barcodes for marine invertebrates on the West-African continental shelf in a project called we call MIWA. The basic idea motivating these activities is very simple in principle. 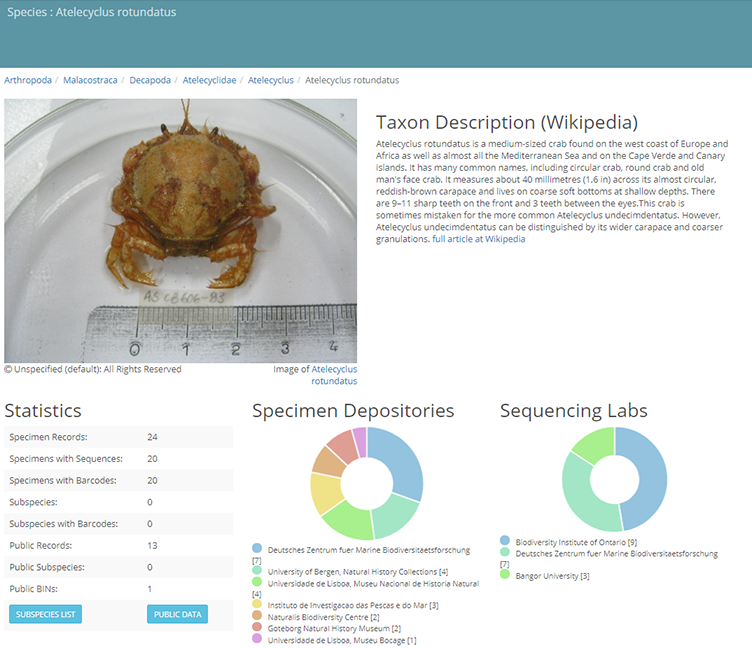 You collect specimens and identify them, preferably to species, take digital photographs, and upload information about collection site and other relevant data to a database (BOLDsystems.org). 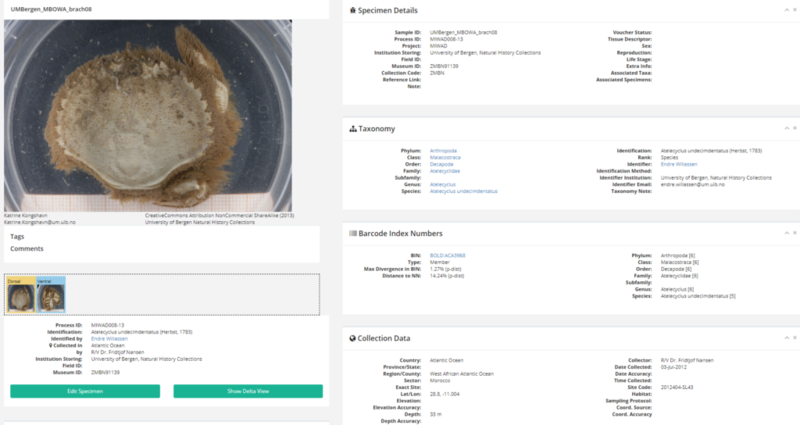 The specimen page has a picture and other data about the organism that the DNA sequence (presumably) was produced from (click picture to enlarge). You take a tissue sample to extract DNA from the specimen and use DNA-sequencing technology to target a special fragment of DNA to read the sequence of nucleotides. 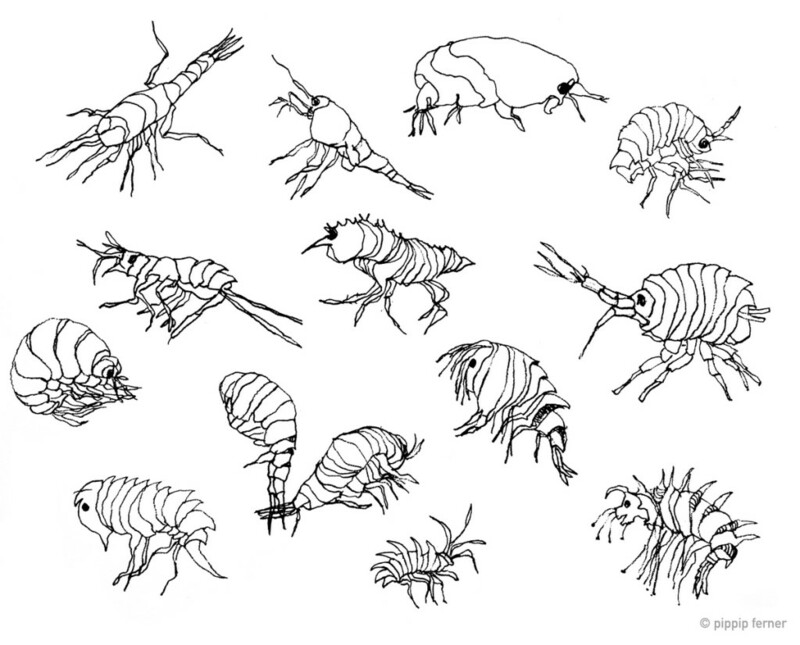 The expectation is that this sequence may be unique for the particular species you identified. If indeed the expectation is fulfilled, you can use that sequence as an unambiguous identifier (“bar-code”) of that species. You have produced a DNA-barcode! Your barcode should enter a DNA-barcode library so that, with an appropriate web-interface to a powerful computer with a search algorithm that compares similarities, you should be able to search with a second sequence from another individual of the same species and find that it is identical, or at least very similar to the one you produced for the DNA-barcode library. The benefits are potentially many. 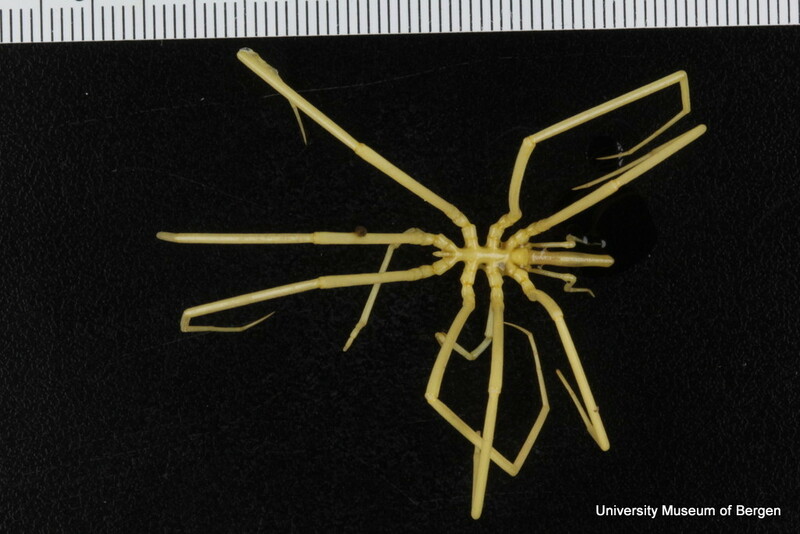 One advantage is that you may be able to identify a species although all the morphological characteristics have been lost. For the biologist DNA-barcodes may help to identify juvenile stages of a species or even the stomach contents of a predator or scavenger. 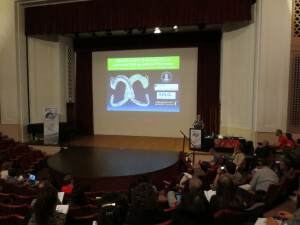 For conservation, customs, trade, and food authorities DNA barcodes are a powerful means to monitor resource exploitation and attempts to swindle with species identities or area of origin of biological products. DNA-barcoding certainly also contributes to the mapping of species distributions and to survey genetic characteristics of taxa. Perhaps initially somewhat unexpected, it also reveals many problems in taxonomy that call for resolution through closer studies. More about this will follow in other blog posts. 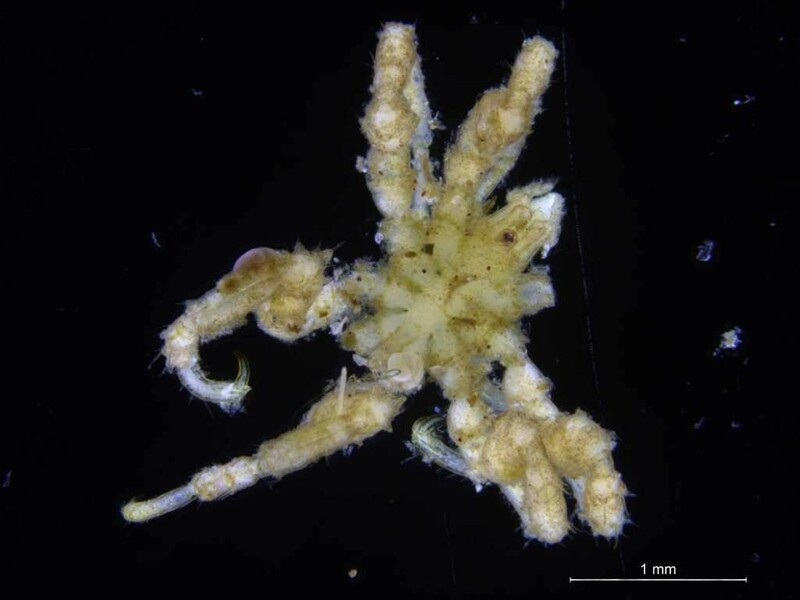 This entry was posted in 2018 december calendar, DNA barcode, MAREANO, Marine Biodiversity of West Africa, NorBOL and tagged bold on December 5, 2018 by EW. 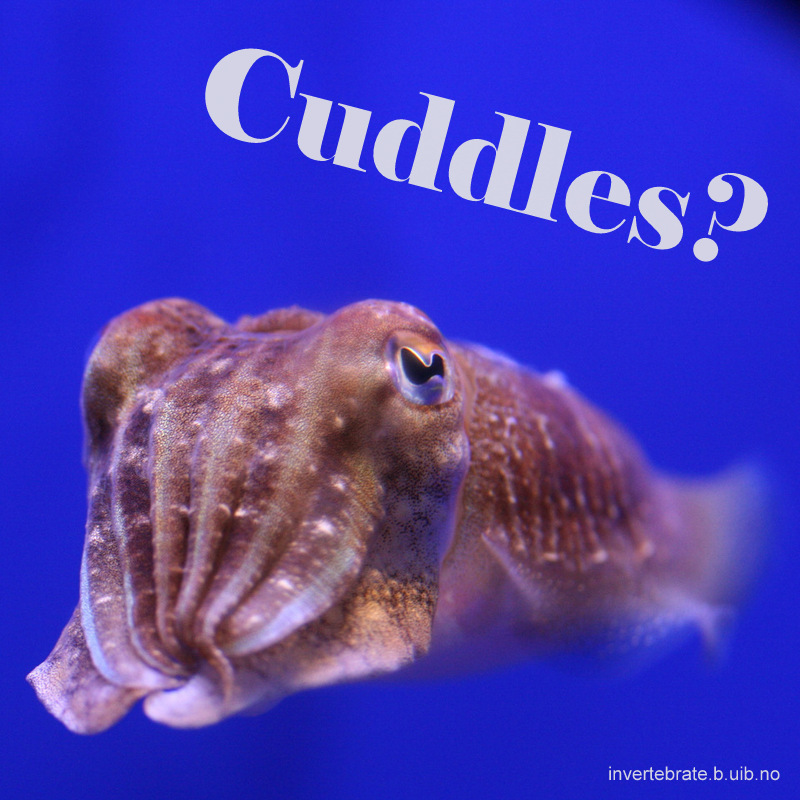 The blog has been quiet over summer – but we’ve been busy! The #AnnelidaCourse2017 came to an end, and happy participants went back to their home institutions with a lot of new knowledge, a increased contact network, and many new friends. Heaps (HEAPS!) 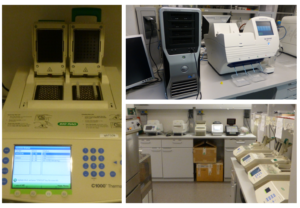 of samples have been cataloged and labeled, DNA-sequencing has completed on the shipment we sent in June and we’re working on analyzing the results, and samples from the cruises we particpated on have and are being sorted. 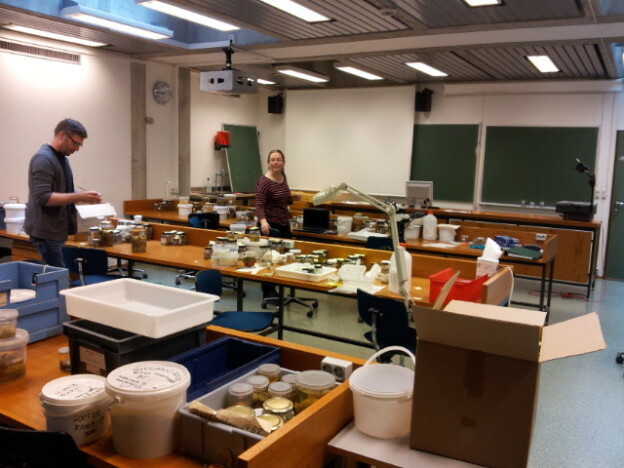 The next shipment of animals to be barcoded through NorBOL is being assembled – of marine invertebrates from our collections, one plate of polychaetes and one plate of isopods have been prepared, and we plan on completing a few more plates before shipping in October. 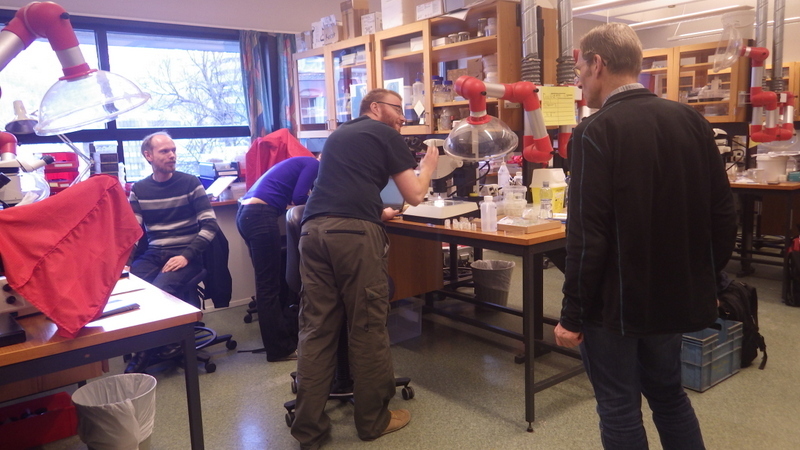 We will also get contributions from several of the Norwegian Taxonomy Initiative projects (Artsprosjekt) that are running, and a plate with insect samples made by the students of BIO233 (I was down there today giving them an introduction to barcoding, NorBOL and the BOLD database) – hopefully we’ll get good results on all of it. 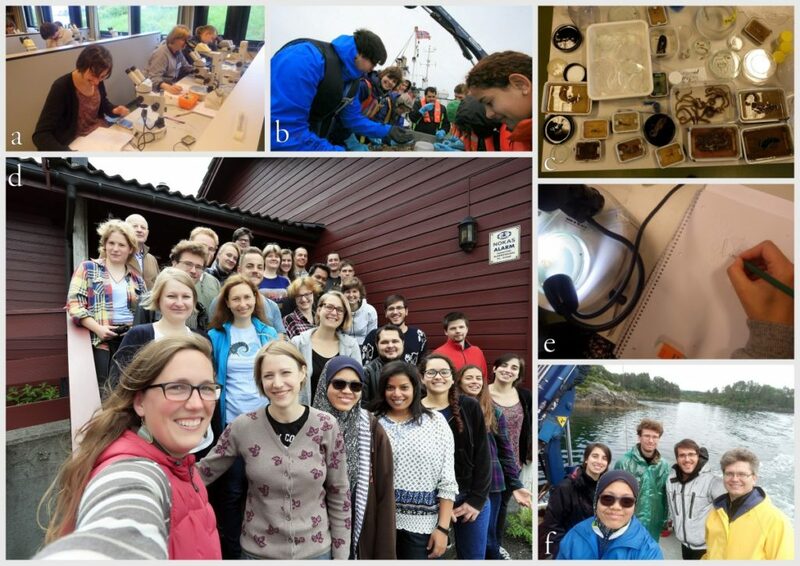 This entry was posted in About, Current projects, Field work, MAREANO, NorBOL, Norwegian Taxonomy Initiative, Photography, Student Projects on September 21, 2017 by katrine. One of the cool things with the NorBOL-project is that it allows us spotlight animal groups that we don’t normally get to do much with. 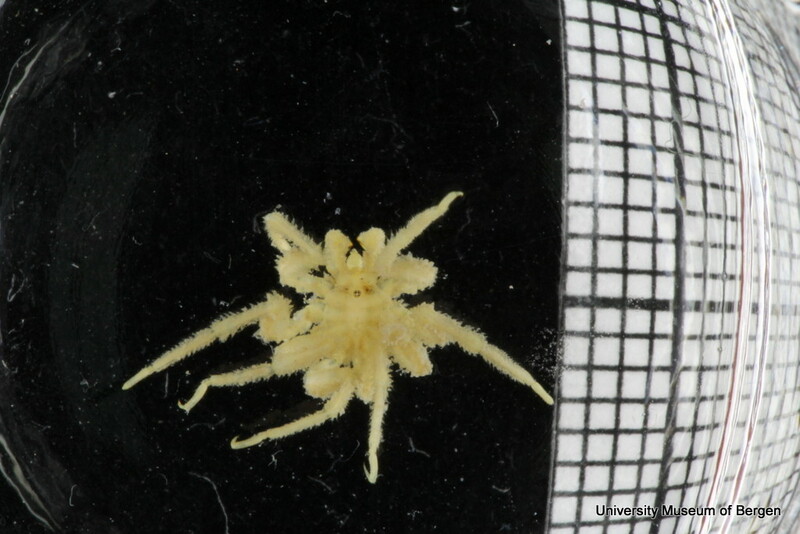 One such group is the sea spiders, or Pycnogonida. 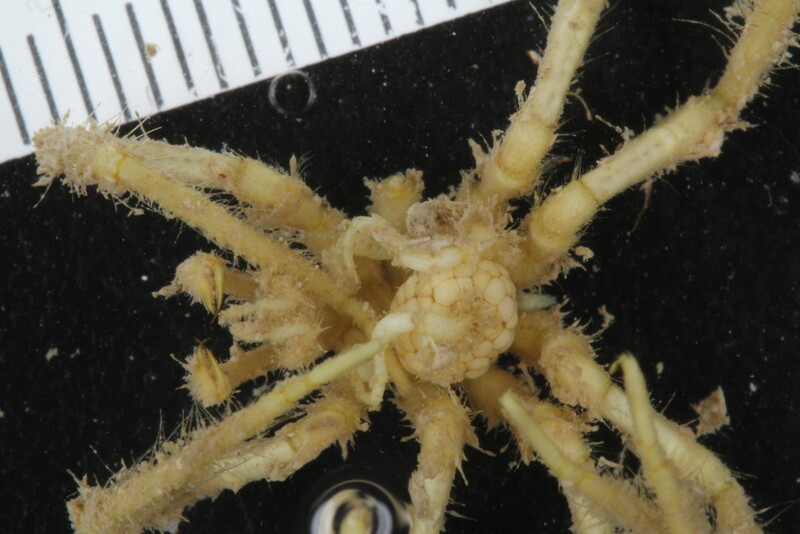 These spider-like critters wander around on the seafloor looking for other invertebrates to snack on (some also live on detritus and algae), and (presumably) for love. I certainly find a lot of them carrying egg sacks and young ones, so they must succeed every now and then! In the Pycnogonida, it is the males who care for the laid eggs and the young, rolling the eggs into one or several balls that he carries around on his ovigers. 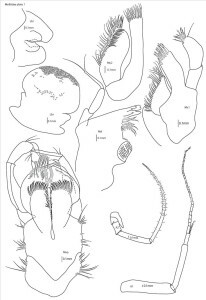 Anatomy of a pycnogonid: A: head; B: thorax; C: abdomen 1: proboscis; 2: chelifores; 3: palps; 4: ovigers; 5: egg sacs; 6a–6d: four pairs of legs L. Fdez (LP) – digitization and colouration. 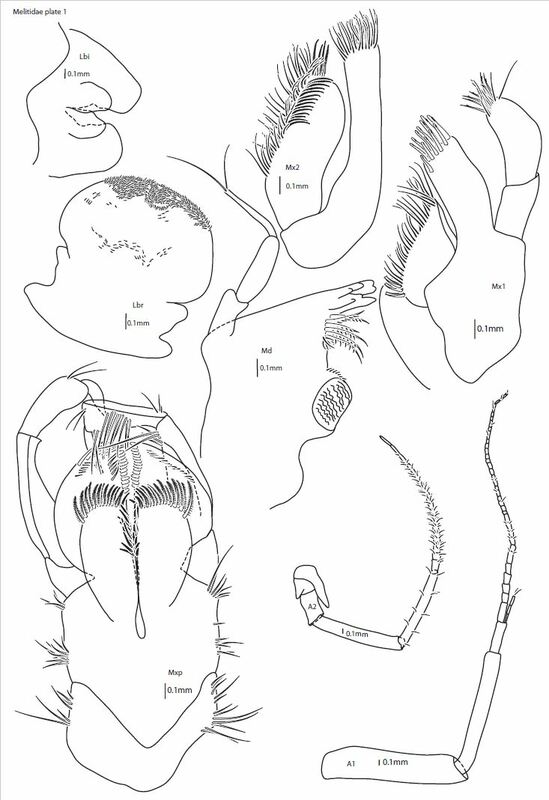 – Own work based on External anatomy of Nymphon sea spider. After G. O. Sars (1895). 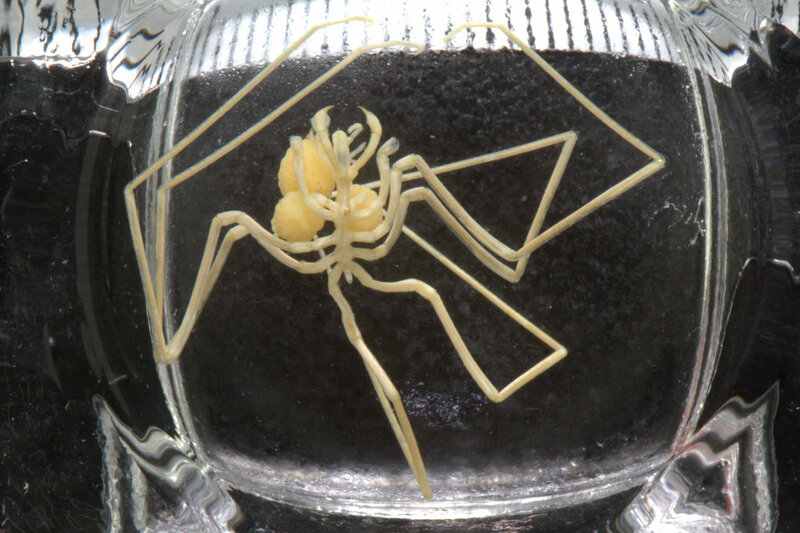 At first glance they look a lot like the spiders we find on land, but they are really a very different class of animals (literally! 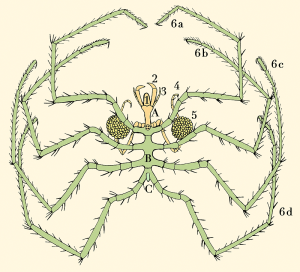 ); The sea spiders are found within Animalia (Kingdom) > Arthropoda (Phylum) > Chelicerata (Subphylum) > Pycnogonida (Class) (from WoRMS), whilst “land spiders” are found within the order Aranea in the class Arachnida. 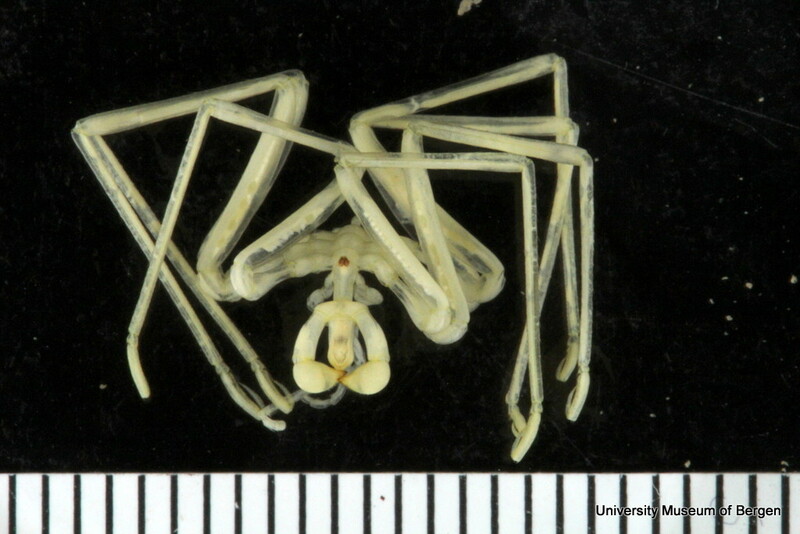 Extant (now-living) members of the Pycnogonida are found within the order Pantopoda, which translates into “all legs”, which describes them quite well! 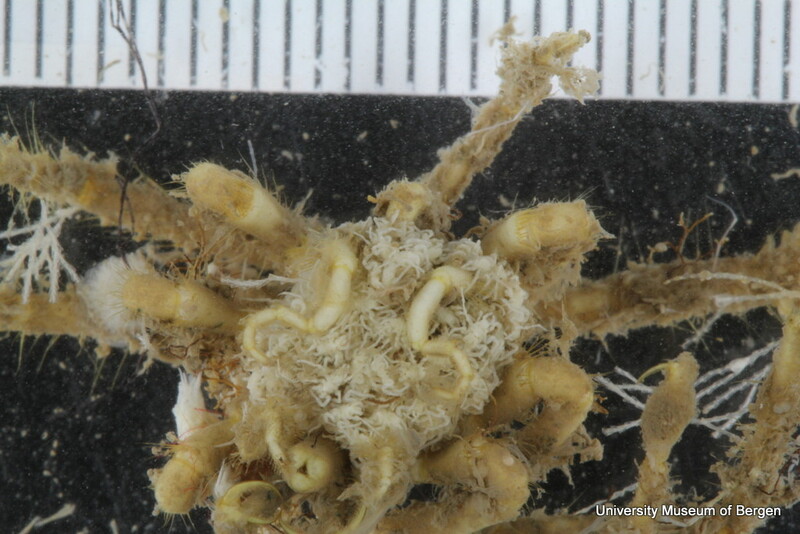 They have even moved most of their internal organs (of which they have rather few; respiration is done across the body surface, so no gills) into the legs. The more I look at them, the funnier they look – but that may be in the eye of the beholder, as a few arachnophobes passing by the camera have declared loudly that there is nothing charming to find here – I beg to disagree! 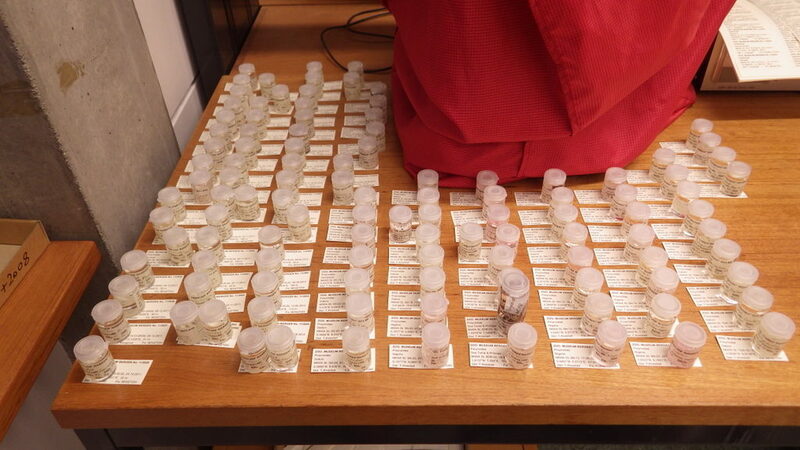 To fill a plate with tissue samples from 95 specimens (1 animal = 1 specimen) of pycnogonida doesn’t sound too complicated, does it? Well, it turned out to be a bit of an adventure to gather enough animals that had been preserved in such a way that we could get DNA out of them (older material is usually fixated in Formaldehyde, which makes it unsuited for genetic work), and that was identified (had a name to them). Since we are in the process of building up the national (and international) reference library (the BOLD database) that the short DNA-segments (the “barcodes”) are to be matched up to later when someone wants to know which species “Animal X” belongs to, we need to know which species we are submitting for sequencing. 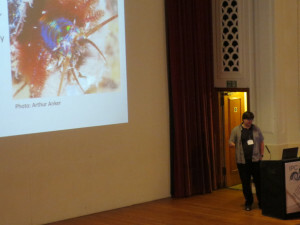 Our collection of barcode-compatible identified pycnogonids received a welcome boost when the shipment of processed material (identified, and measured for biomass) from MAREANO‘s beamtrals collected in 2013 arrived, as these had been fixated in ethanol – and identified by researchers who have worked extensively with the group. 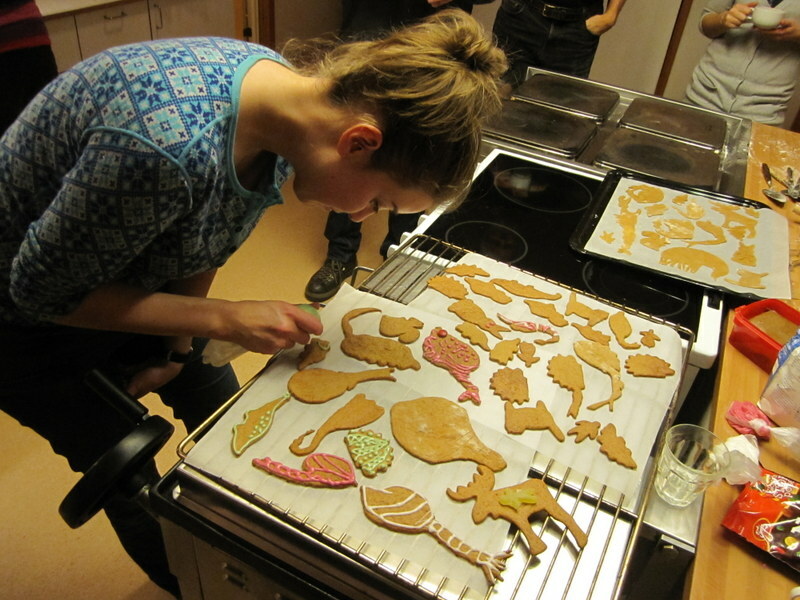 Even so, I couldn’t fill a whole plate with only those specimens. Thankfully, I have skilled collegues that were able to put species names to almost all of the critters I could hunt down in our collections, and so now we have 95 animals ready from 26 different species! We also have some bona fide mysteries that we hope the BOLD-database will help us solve as well; animals that does not comply with any of the identification keys…! 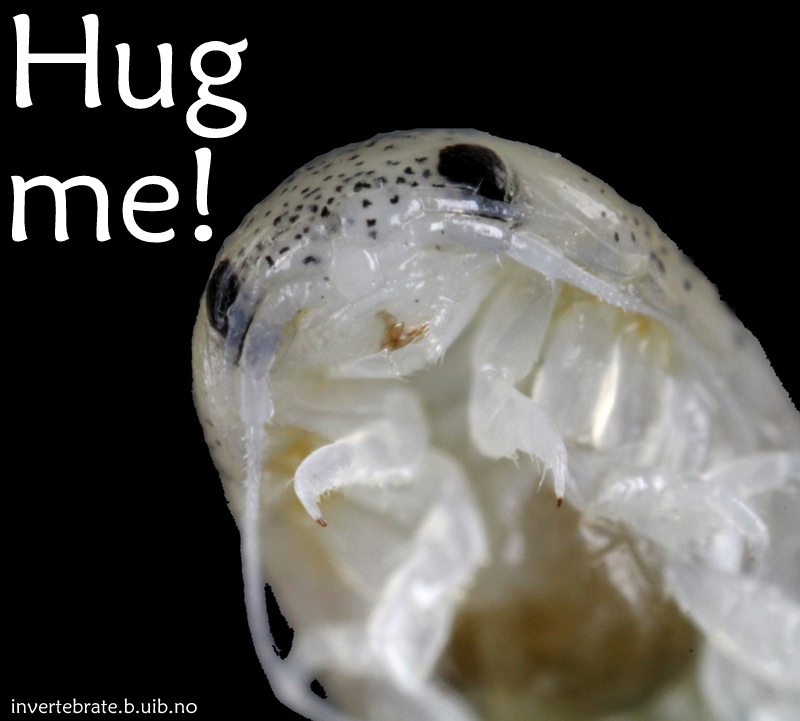 Fingers crossed for a very successful sequence run and a lot of new information about the Pycnogonida of Norway! This entry was posted in 2016 december calendar, About, Current projects, Field work, MAREANO, NorBOL, Photography on December 4, 2016 by katrine. 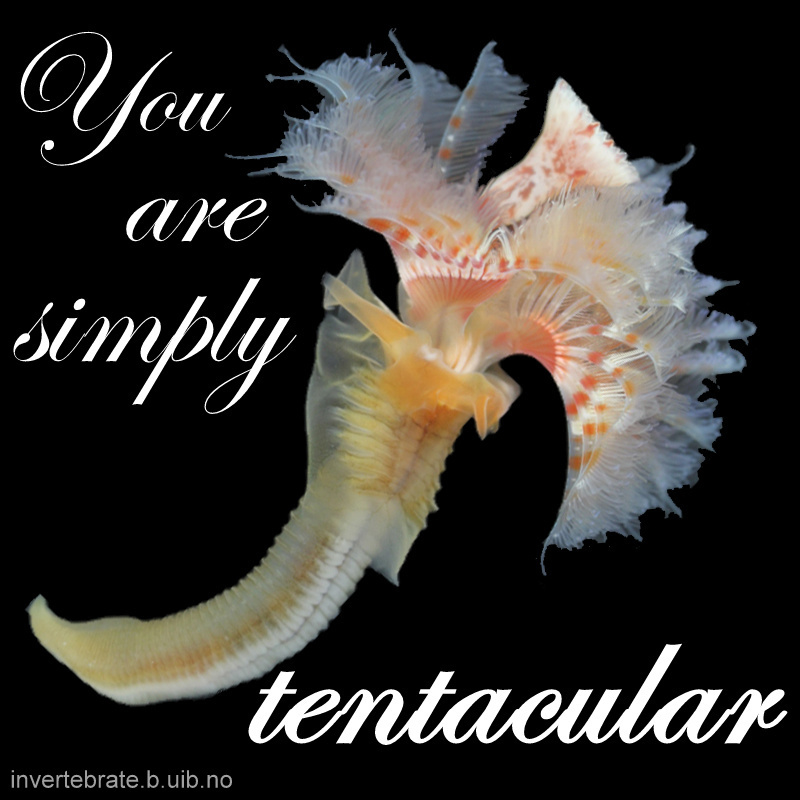 Please share your love of biodiversity this Valentine’s Day with the hashtag #bdvalentine. 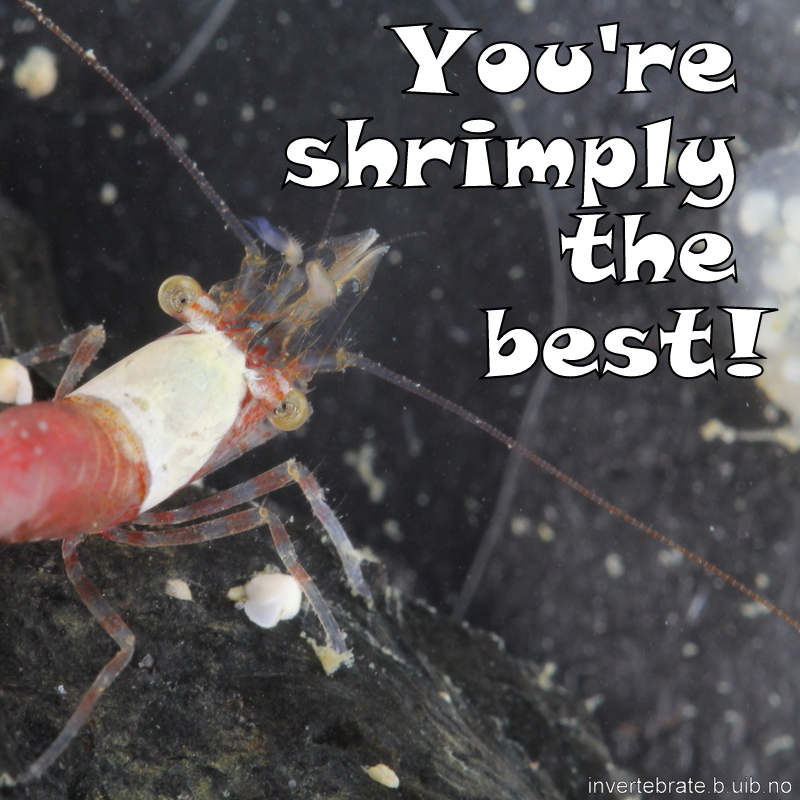 Have fun and help raise awareness of biodiversity and conservation! 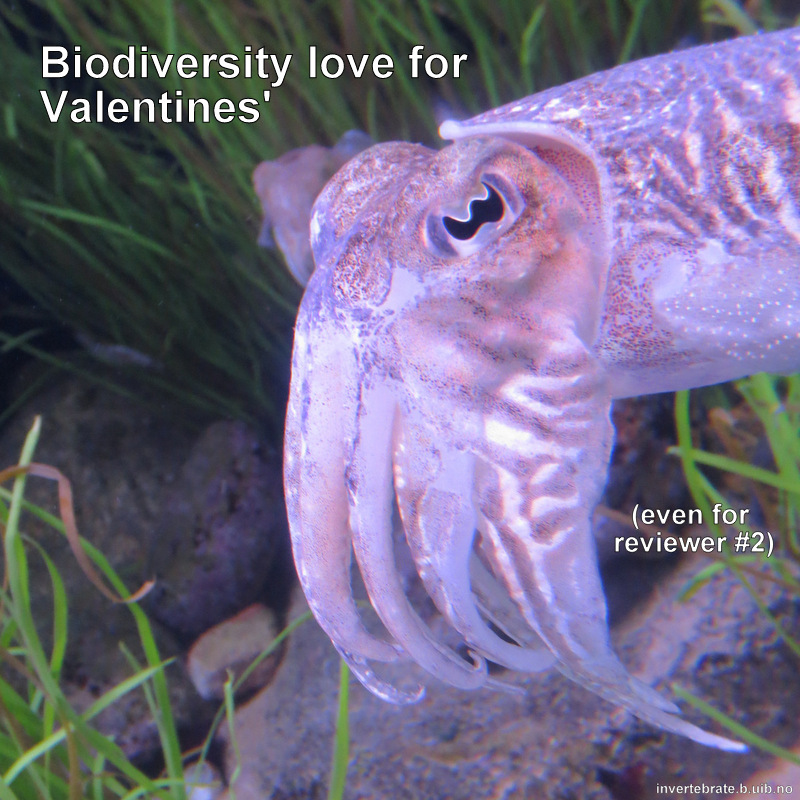 We’ll be on Twitter and Facebook celebrating all day on Friday, February 12th with “Biodiversity Valentines.” Tweet your best biodiversity-themed Valentine message with the hashtag #bdvalentine. 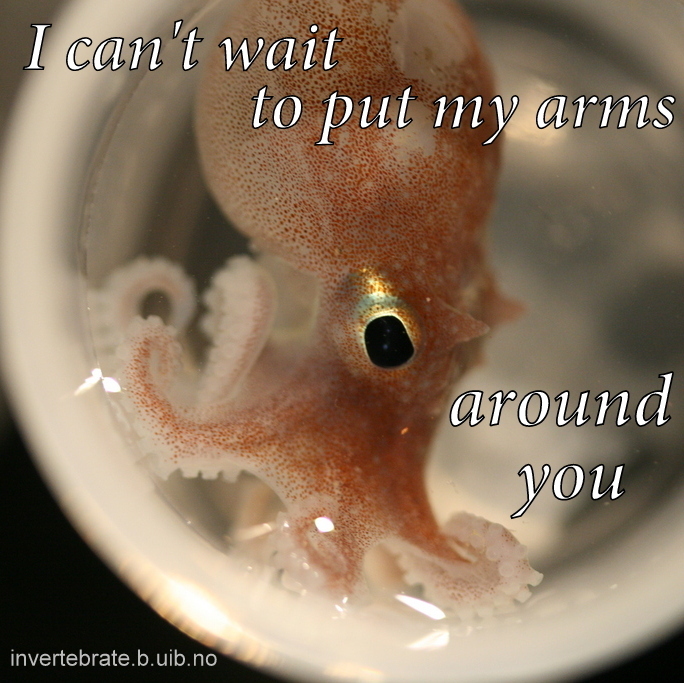 You can borrow from our growing Facebook gallery of #bdvalentine images here: https://goo.gl/dZkQdS . Get your creative juices flowing (and your creative and communications folks brainstorming)! We’ll retweet and create a gallery of your images all day on Friday, February 12th. At JRS, we’re working to increase the use of biodiversity data and information services for conservation and sustainable development in Africa. 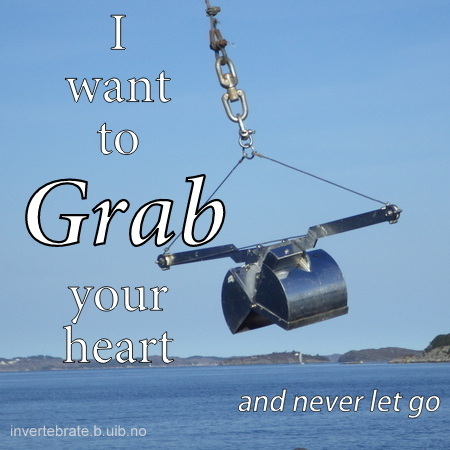 We love biodiversity data. 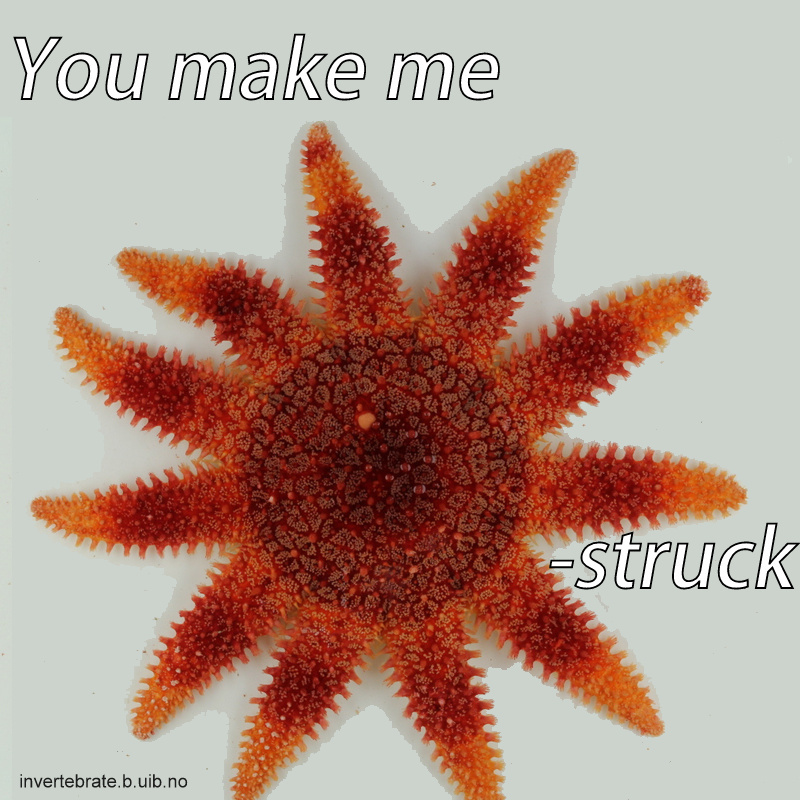 Join in with your #bdvalentine! 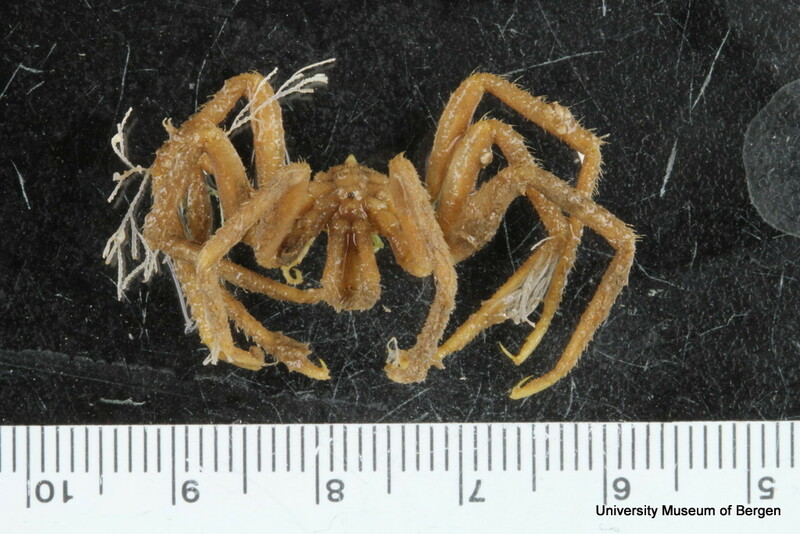 ticked into our in-box from the JRS Biodiversity Foundation a couple of days ago, and we decided to give it a spin. 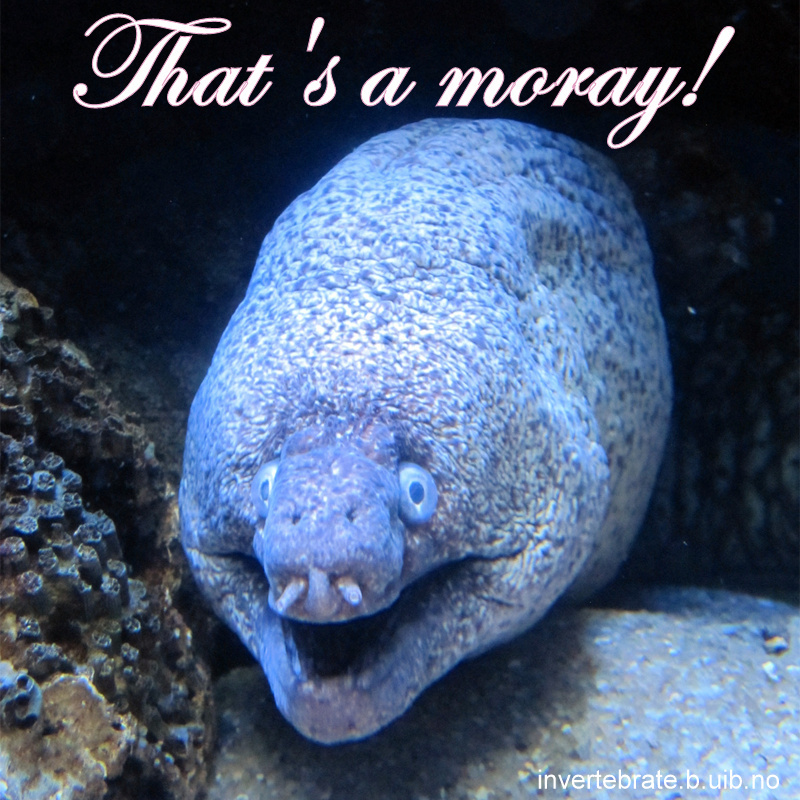 Now, biologists seem to gravitate towards punny (and occasionally funny) humour, and there’s been an avalanche of submissions and suggestions on what we could post. 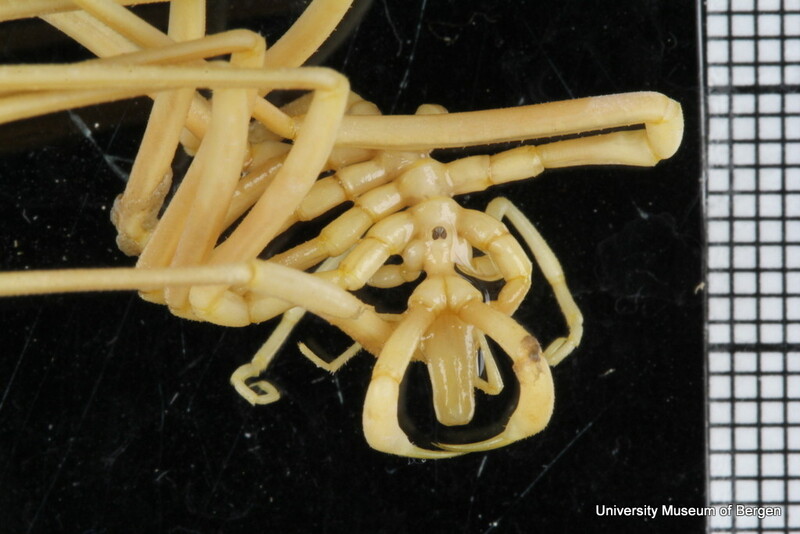 Here’s a selection of submissions from the Invertebrate collections, we hope you’ll enjoy them! Not a local species! 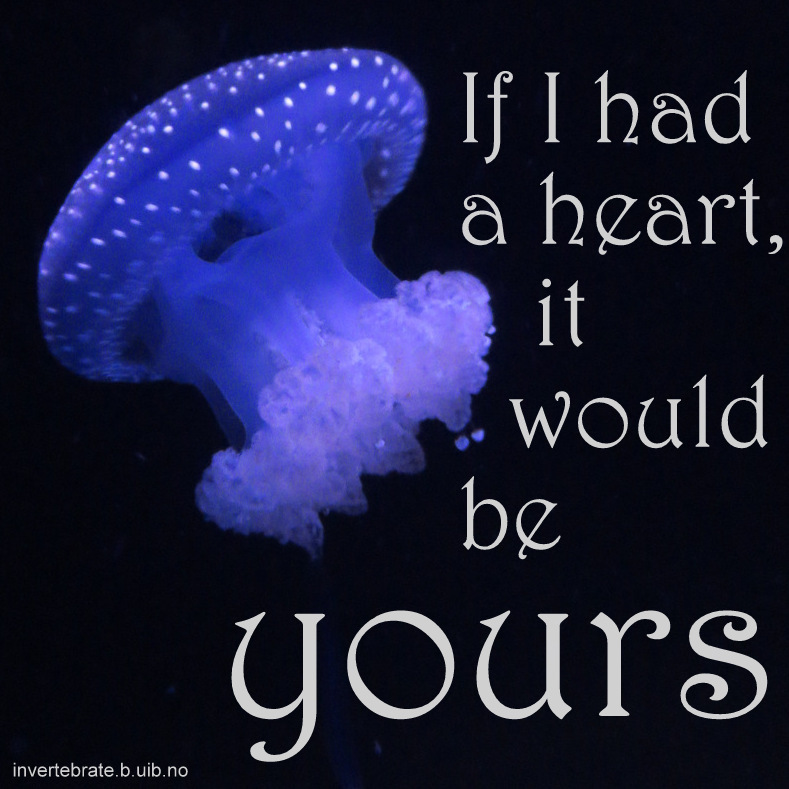 Jelly fish do not have a independent circulatory system, nor do they have structured organ systems, brain, or breathing apparatus. A friendly (?) Isopod from the Cirolanidae family. 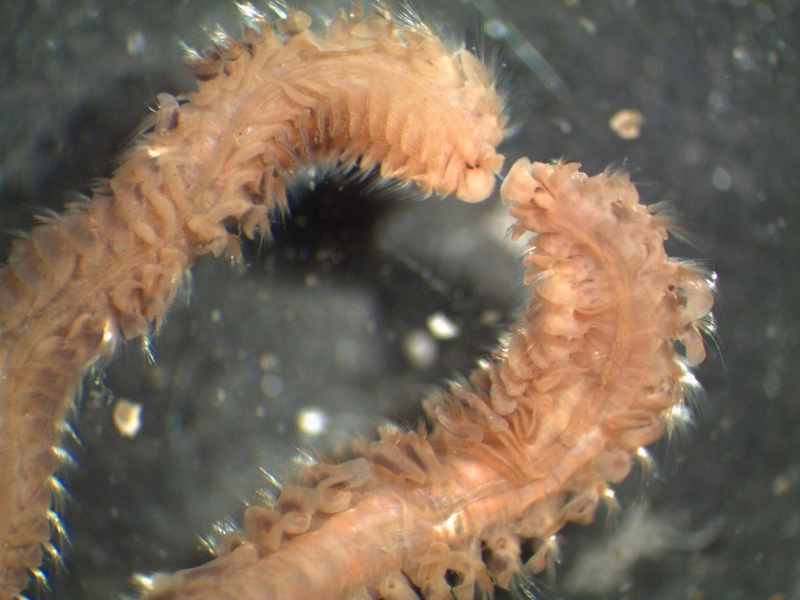 Uncini bristles from a Euclymene (Maldanidae) polychaete. 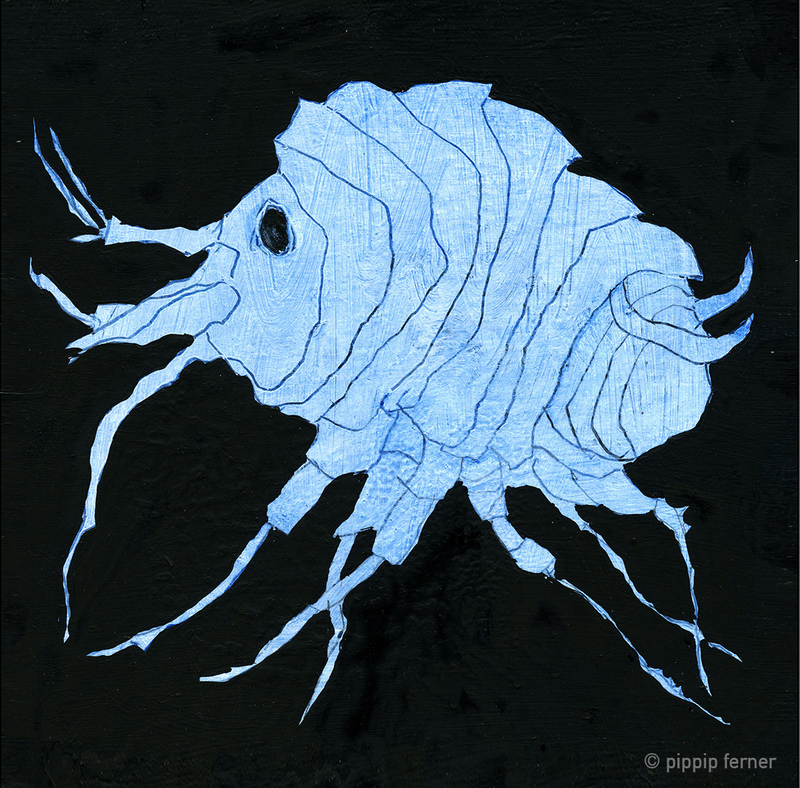 The picture is taken with an Scanning Electron Microscope (SEM) at our local SEM lab. The scale bar is 2 µm, or 0.002 mm, so these are truly TINY structures. 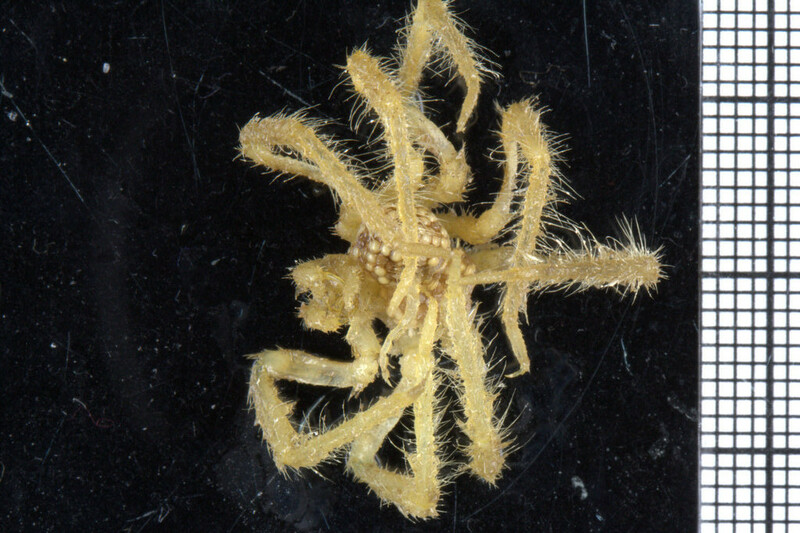 Here’s an Ebalia sp. 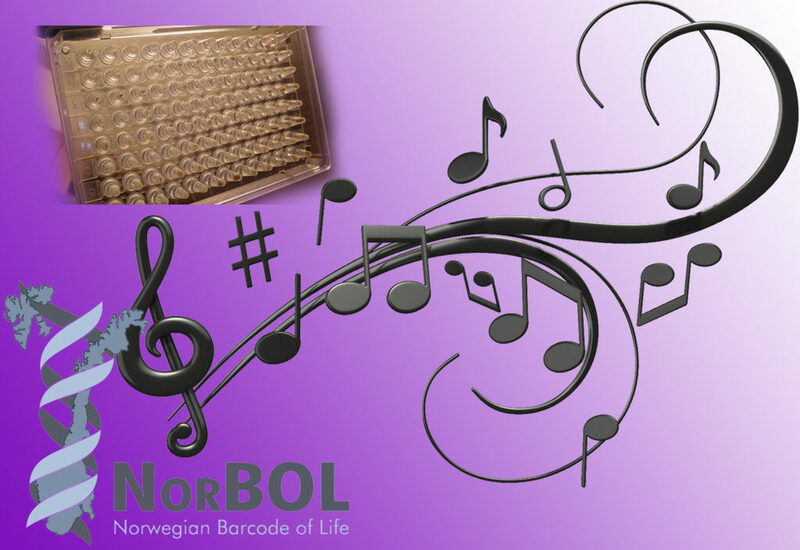 that we have barcoded through NorBOL. 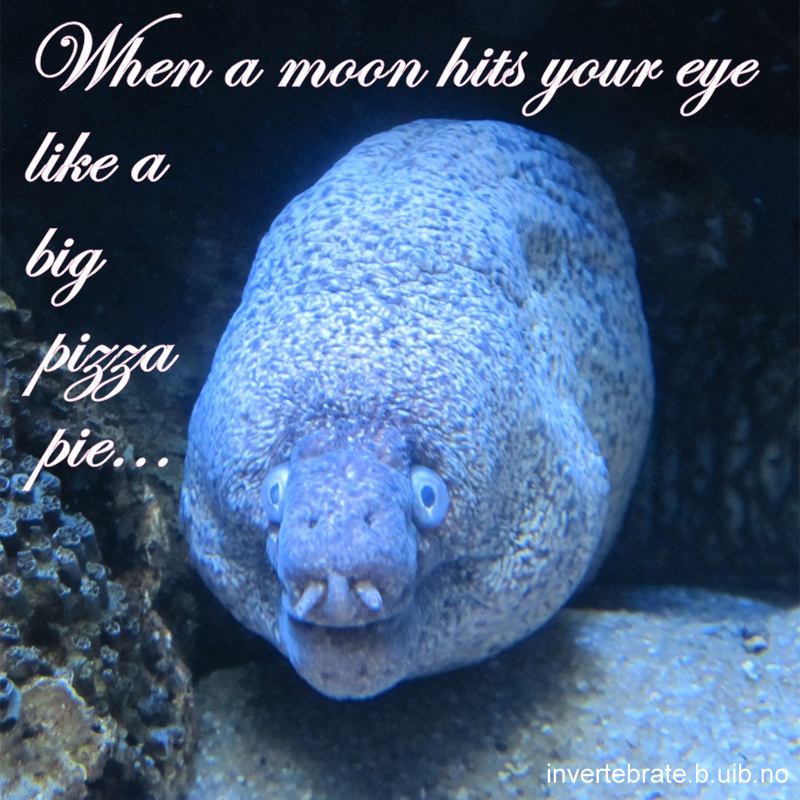 apologies for the ear worm! Well, we sure had fun – we hope you did too! Make sure to check out other contributions to the hashtag #bdvalentine on Twitter and Facebook. 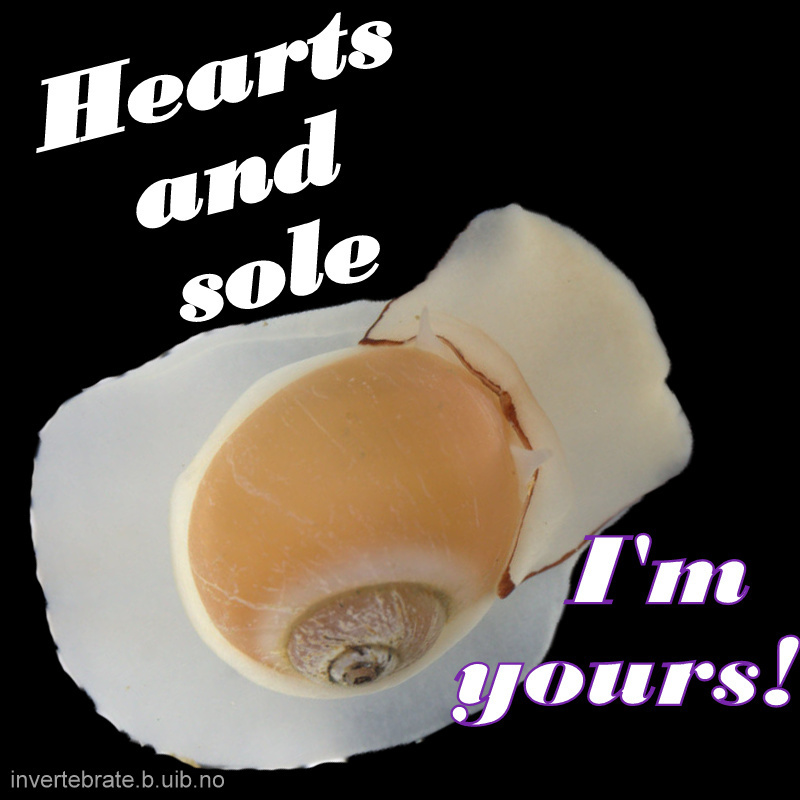 This entry was posted in About, Current projects, MAREANO, NorBOL, Photography, publicity and tagged #bdvalentine, biodiversity, marine invertebrates, puns on February 12, 2016 by katrine. 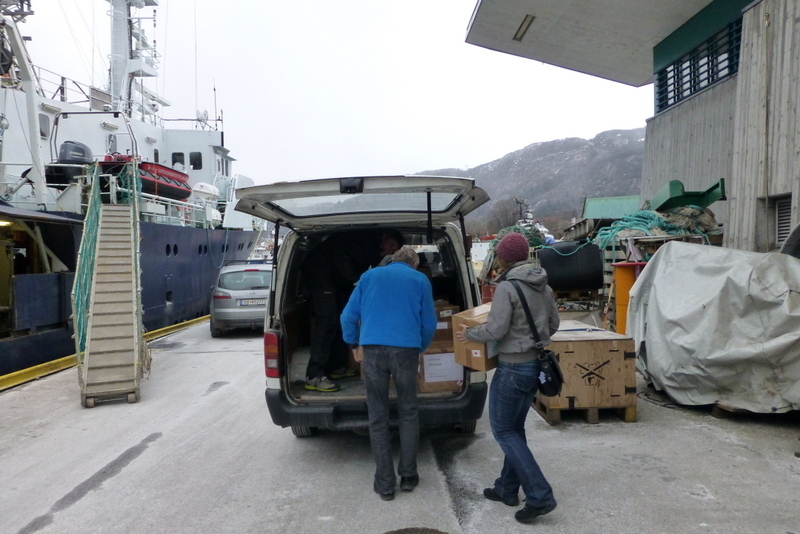 As mentioned earlier in our calendar, we have an extensive cooperation going on with the seabed mapping programme MAREANO*. 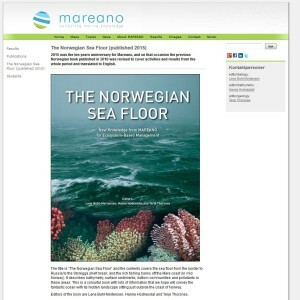 You can read a lot more about MAREANO on the project home page, where you will also find many interesting videos and beautiful photographs from – quite literally – the bottom of the sea, as video transects are extensively used for mapping the sea floor and its biodiversity. 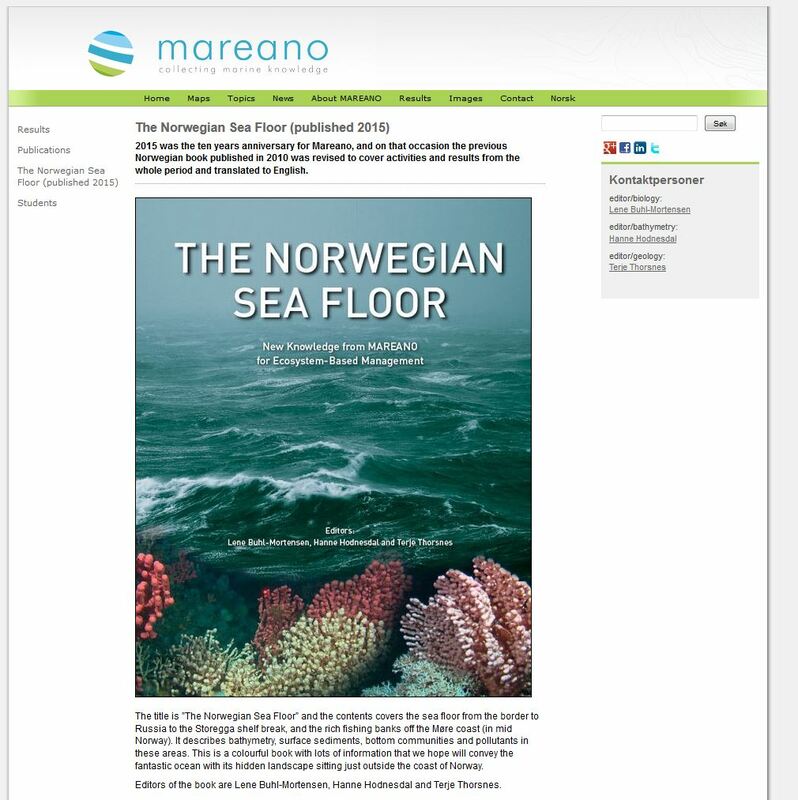 MAREANO very recently published a book named “The Norwegian Sea Floor – New Knowledge from MAREANO for Ecosystem-based Management”. 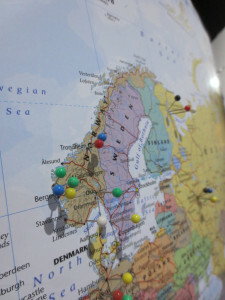 As it presents the uniquely detailed mapping that is being carried out, it has received much attention (also internationally, more about that here and here (in Norwegian)). You can access the book as a pdf though the MAREANO web pages – check it out! 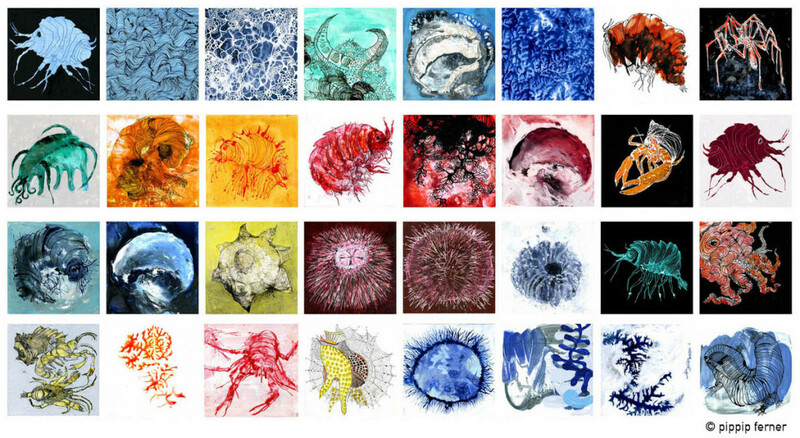 We wanted to include a post in our advent calendar about the part the University Museum plays regarding the thousands and thousands of biological samples that MAREANO generates. 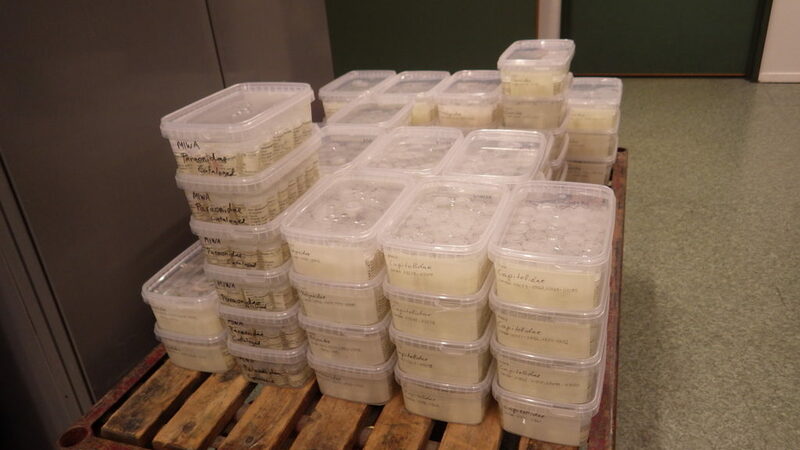 The MAREANO material is a big part of our everyday work here, and so it’s been blogged about before: follow the links to learn more our about cruise participation, workshops (e.g. 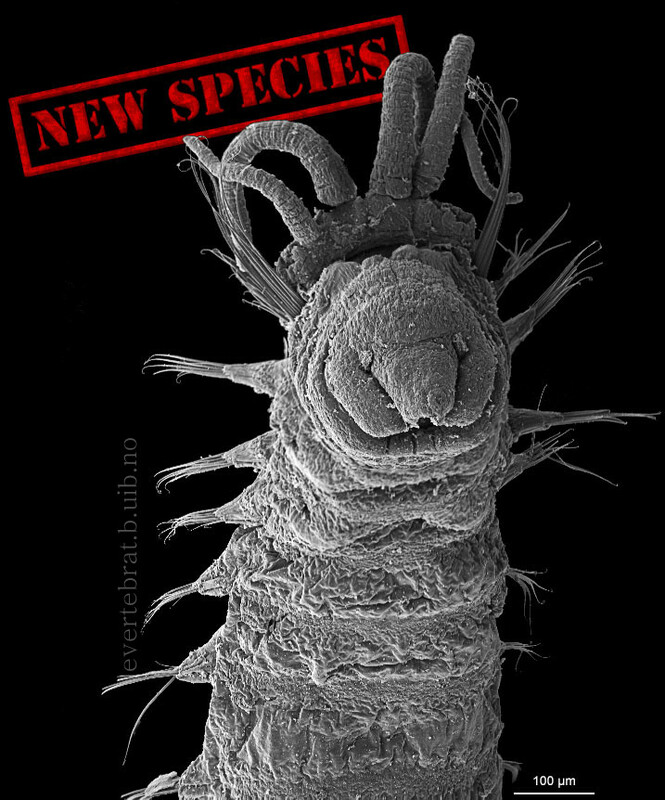 here and here), new species described from UM based on MAREANO-material, and genetic barcoding through the Norwegian Barcode of Life (NorBOL) project. Now, any project – even one as extensive as MAREANO – does have a finite life span, whereas museum collections are (at least in theory) here for “eternity”. This means that we have to try and envision what material will be important not just right now, but also in the future – whilst we simultaneously deal with the constraints of limited time and space. It is not feasible to keep everything, but we do try our best to make sure that we keep that which is most important. 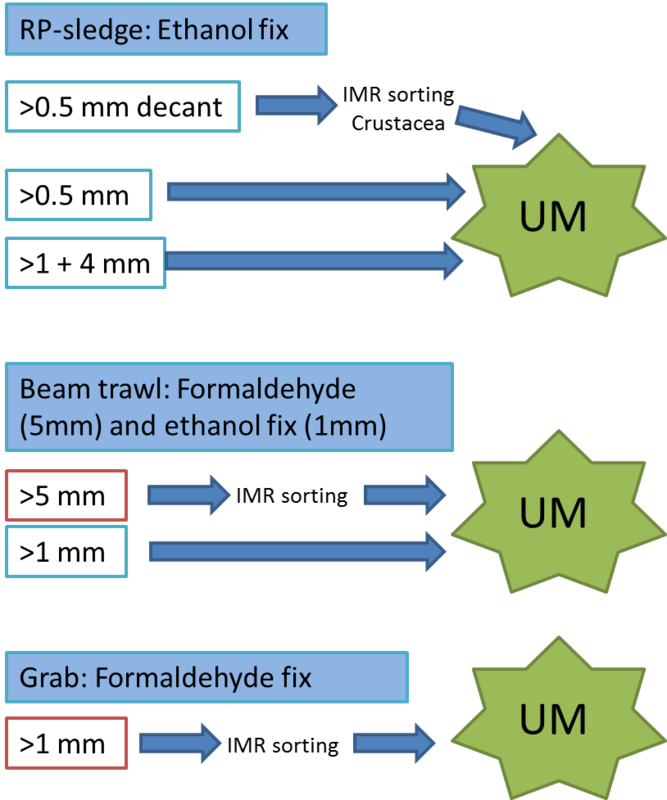 The fact that MAREANO collects material not only in formalin (good for morphological studies), but also in ethanol (which – unlike formalin – enables us to do genetic analysis) is hugely important as we get the best of both worlds delivered – by the pallet! 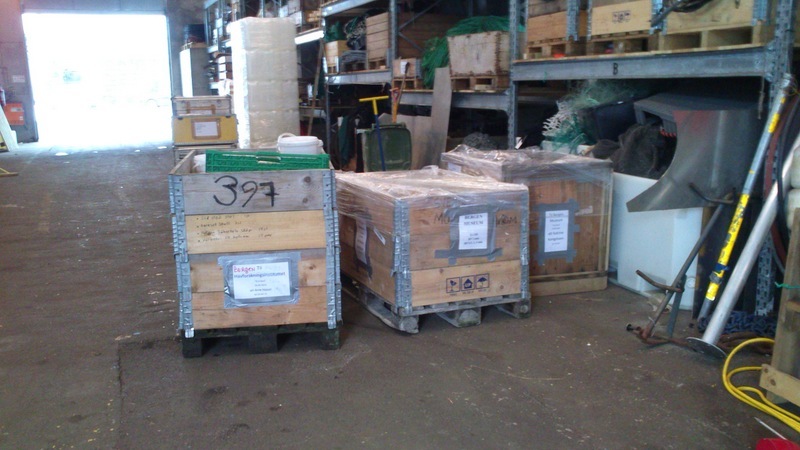 Once we receive a shipment of material, we get to work – the identified animals are unpacked, and an assessment is done on how to proceed with them; catalogue them into the museum collection, interim catalogue them into our “project catalogue”, leave them untreated for now, catalogue and pass it on to researchers working on that particular group of animals, to include it in our current projects, or discard it. 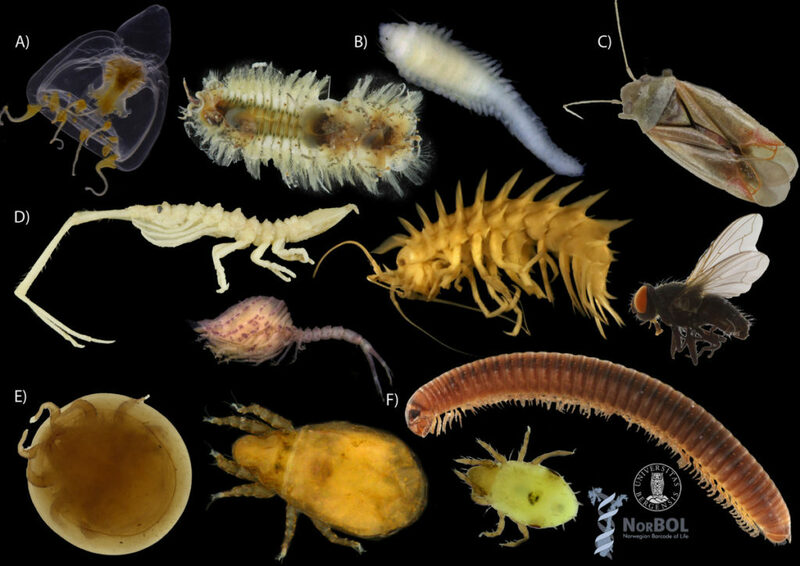 The unsorted fractions require even more TLC; the first step is for us to separate the animals from the sediment – from there on it goes through much the same process as the identified critters. 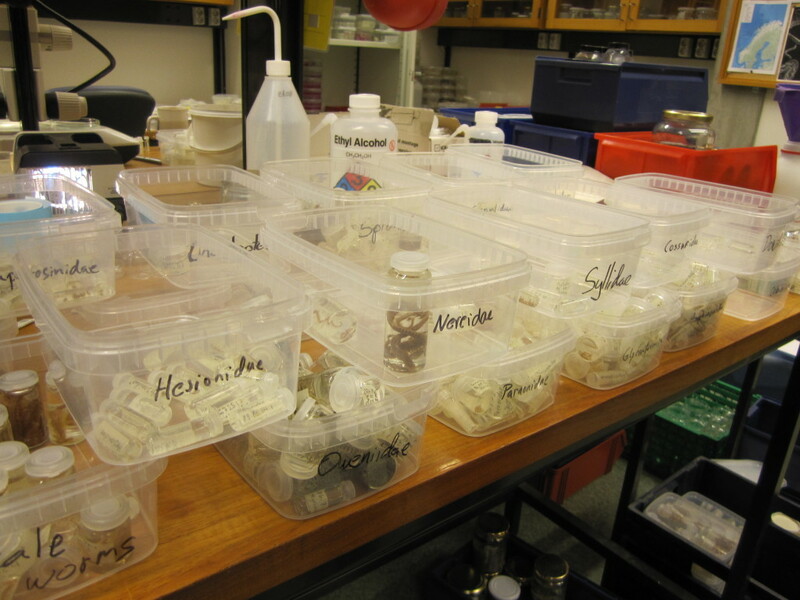 These unsorted (and mostly ethanol-fixed) samples have yielded many interesting finds, and will undoubtedly continue to do so! We have so far submitted over 1300 specimens collected by MAREANO to be DNA-barcoded through the NorBOL project, and this number will continue to rise. But why do we need to keep all this material? Isn’t it “done” once MAREANO has done their identification of the fractions that they process? Of course not! This material is a veritable gold mine for scientists, and it keeps on giving; MAREANO in it self aggregates a huge amount of interesting data (see here, for instance). 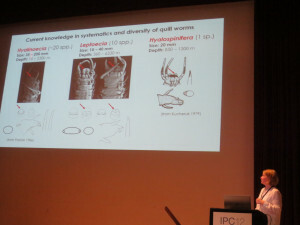 However, there are still many animal species groups that are extremely difficult to identify and when specialists on specific groups get the chance to compare specimens from different regions of the world, they very often find that original taxonomic identifications have to be revised. There are many reasons for that. 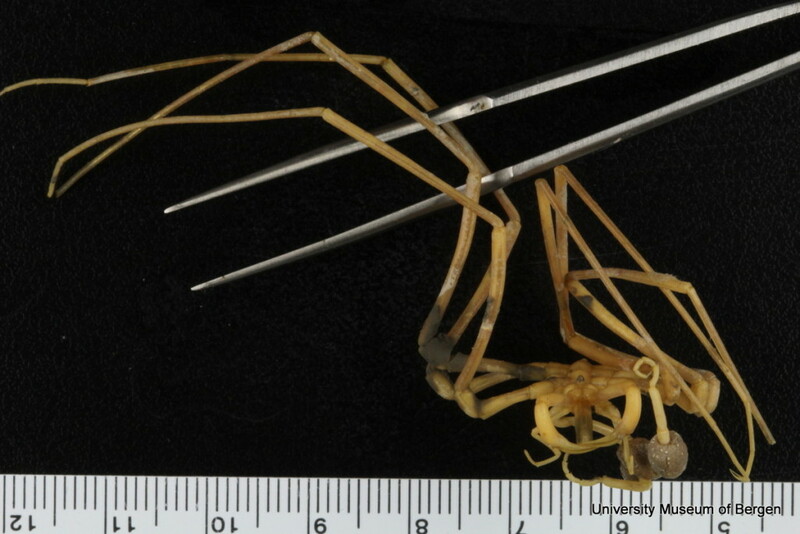 Specimens may simply be misidentified. The revising taxonomist may also discover that specimens of the same species are called with different names in different laboratories. 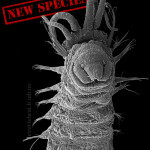 With applications of DNA-techniques it may also became apparent that what was originally considered to be one widespread species is actually several different species that have to be described and named. So there are at least two main reasons why museums are eager to access and store material from projects like MAREANO and MIWA. 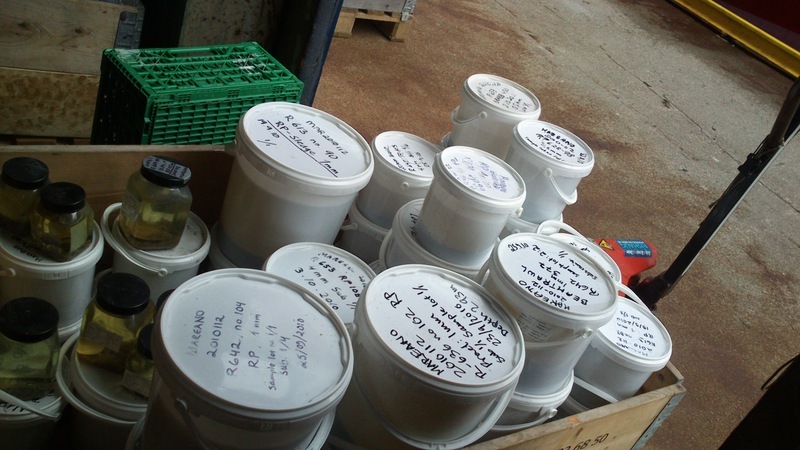 One is the fantastic opportunity to get fresh specimen for research. 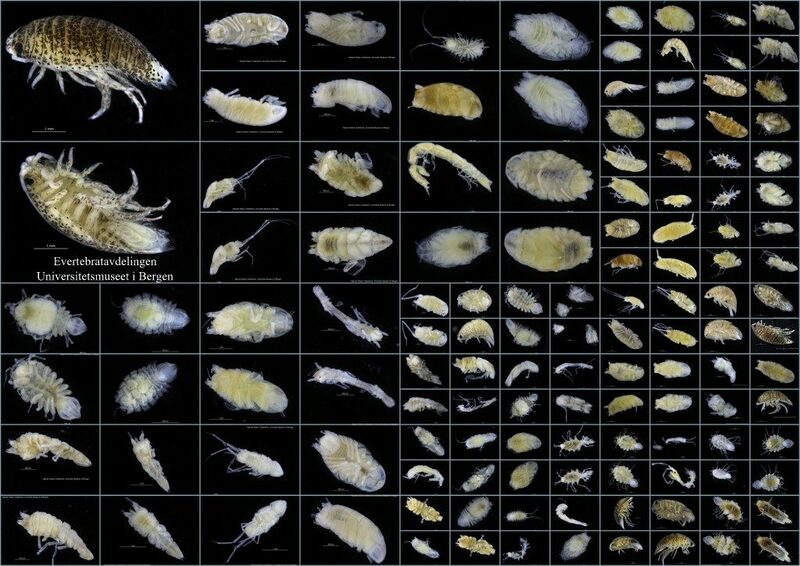 Another reason is to safeguard and document the physical objects that the data were based on and to offer open access to study the specimens for the scientific community of researchers in biodiversity. 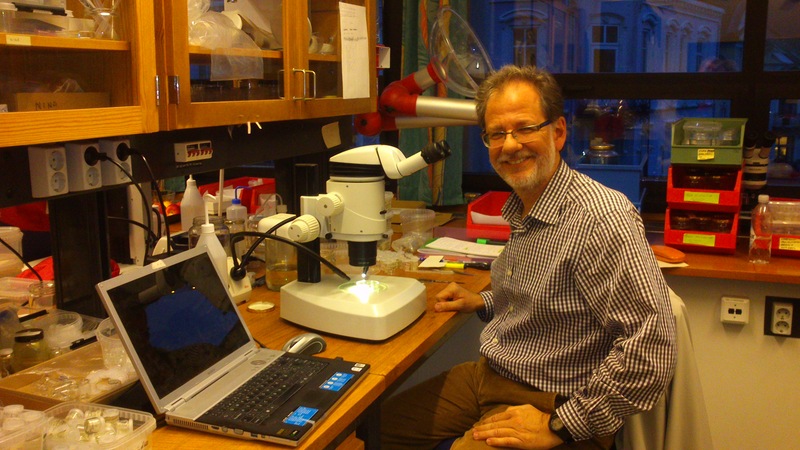 Taxonomic studies may take a lot of time to complete, and taxonomists are scarce – so new results will continue to emerge at erratic intervals. Thus the collected material is – and will continue to be – invaluable to scientific community for many, many years to come. 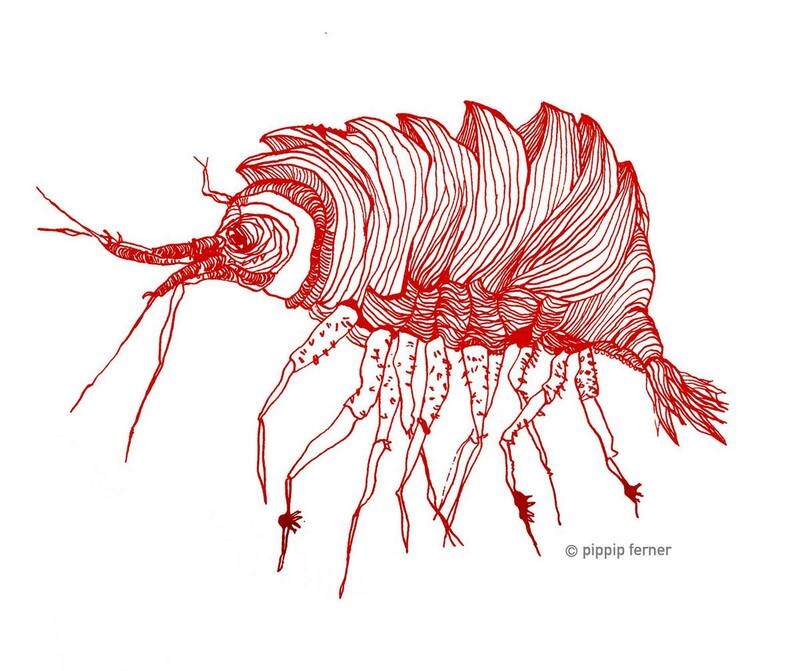 There are still many new species waiting to be discovered (such as the little polychaete Ampharete undecima (Alvestad et al 2014), or the Amphipod Halirages helgae (Ringvold & Tandberg 2014), and there is much, much more to be learned about the distribution, habitats and life history of the species that we do know. Therefore we are both proud and grateful to play a part in the safekeeping of this valuable material, and hope that it will continue to bring exciting new knowledge! 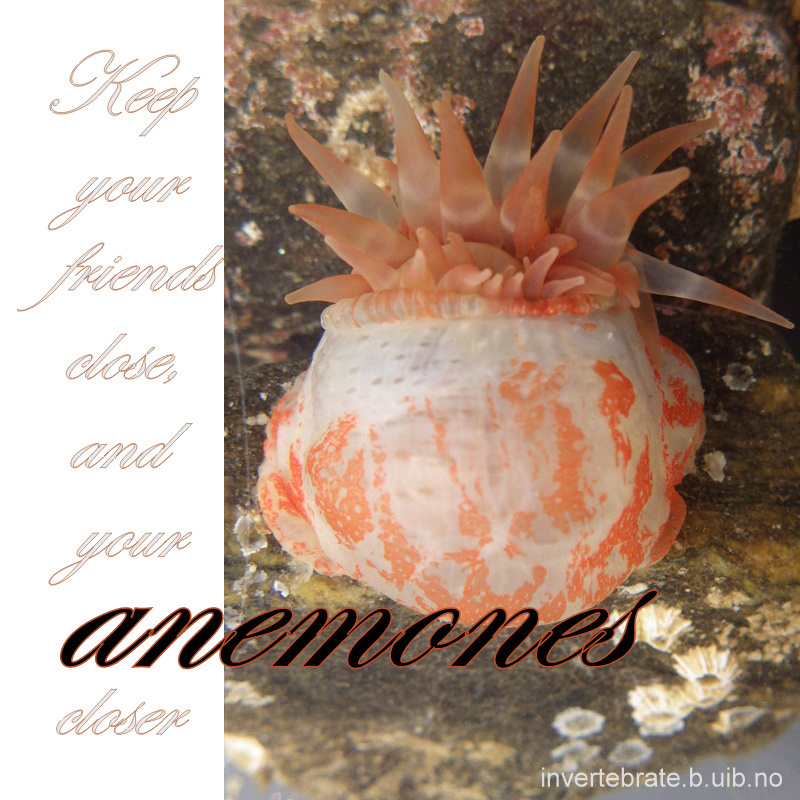 Alvestad T., Kongsrud J.A., and Kongshavn , K. (2014) Ampharete undecima, a new deep-sea ampharetid (Annelida, Polychaeta) from the Norwegian Sea . Memoirs of Museum Victoria 71:11-19 Open Access. This entry was posted in 2015 december calendar, Current projects, MAREANO, NorBOL, Photography, PolyNor, Workshops on December 23, 2015 by katrine.